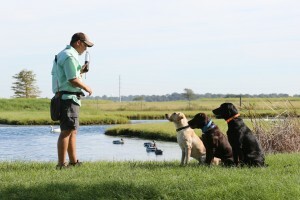 Texas Duck Dogs provides obedience and retriever training in Katy, Texas, and to all the Houston area. We are dedicated to providing high quality retriever training and obedience training, along with excellent care for our client’s dogs! Click here for a description of our TRAINING PROGRAMS. Training Fees vary depending upon the program your dog enters. The monthly training fee includes: boarding fees, bird fees, field fees, and one on one training sessions with the dog and owner. Wade Cashion has been training retrievers since the age of 18. Before that he competed in field trials with American Foxhounds. For over 5 generations the Cashion family has been active in the world of competitive hunting dogs. Earning AKC titles is often a goal of our clients, and we love to help them achieve it. It is extremely rewarding to see your dog successfully compete in a sport that he was born to do. Ask us about AKC Hunt Tests, and how your dog can win ribbons and earn titles at these events!